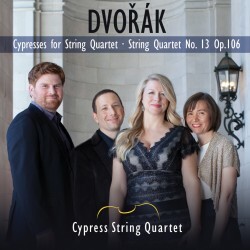 The San Francisco-based Cypress String Quartet, known equally for its innovation and its elegant performances, debuts on AVIE with a recording of its namesake work, Dvořák’s Cypresses, a set of twelve love songs scored for string quartet, coupled with the composer’s expansive G major Quartet, No. 13. Known internationally through touring and a dozen acclaimed recordings, the Cypress String Quartet traverses repertoire from J.S. Bach – the composer with which the foursome forged their signature, clear and transparent sound – to world-premieres of works they have commissioned from such composers as Jennifer Higdon, Kevin Puts and Elena Ruehr. In addition to appearances in such renowned venues as the Kennedy Center, the Ravinia Festival and Cal Performances, the Quartet reaches out to new audiences through regular performances in community centres, unorthodox spaces, and schools.